It's baby season in the animal world - making it more likely that you might find yourself bumping into baby birds who have fallen to the ground or even a litter of kittens all piled up in a box. Then, there are baby deer. When people find them alone, they often make the mistake of believing they need to be rescued, when in fact, it's more than likely the fawn's mother will return for him or her. All you should do at first is wait. Since fawns are too weak to keep up with their mothers for the first few weeks of their lives, they typically wait in the vegetation, with the mother going off to feed and returning every so often to nurse her child. A state police officer in Harford County, Maryland, found herself in that exact situation on Tuesday. 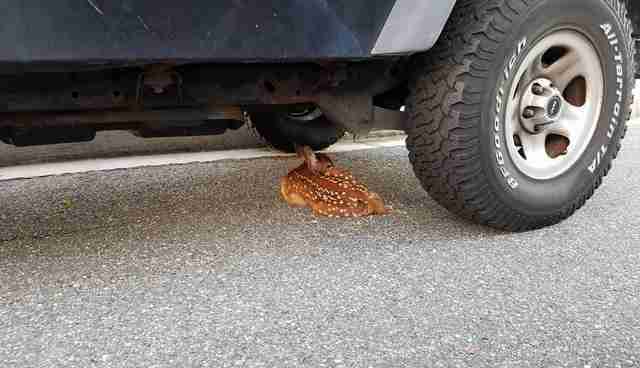 The officer, along with her neighbors, found a fawn curled up underneath a car. 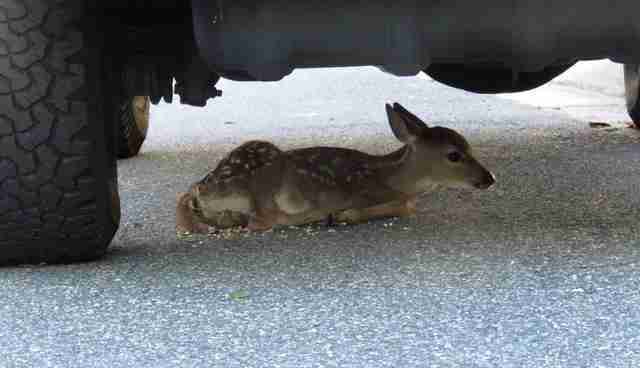 They then did the right thing by waiting to see if the fawn's mother would come back for her. 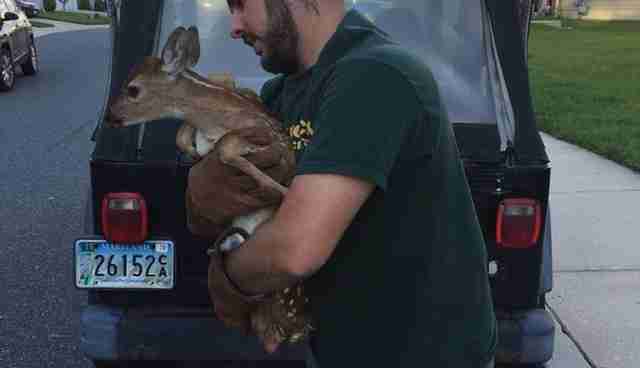 "It soon became apparent that the deer was in fact injured and needed care," Susquehannock Wildlife Society wrote on Facebook. That's when the Maryland Natural Resources Police (NRP) was called in, and they got in touch with Susquehannock to aid with the rescue effort. 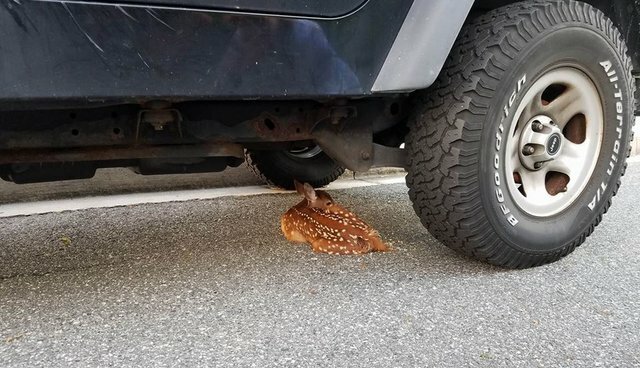 Scott McDaniel, president of Susquehannock, told The Dodo that he and a colleague climbed underneath the car to get closer to the young deer, as well as prevent her from bolting, which would undoubtedly stress her and her injury further. "I placed my gloved hands on her and tried to comfort her with a soothing tone," McDaniel said. "Since she was wedged, we couldn't lift her up. I rolled her on her side to protect her legs and inched myself back out from under the vehicle with her in my arms." 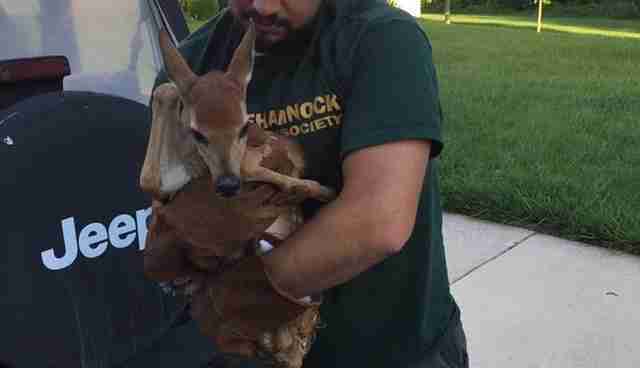 From there, the fawn was taken to the Chadwell Animal Hospital, where she was placed under the dutiful care of a wildlife rehabilitator. 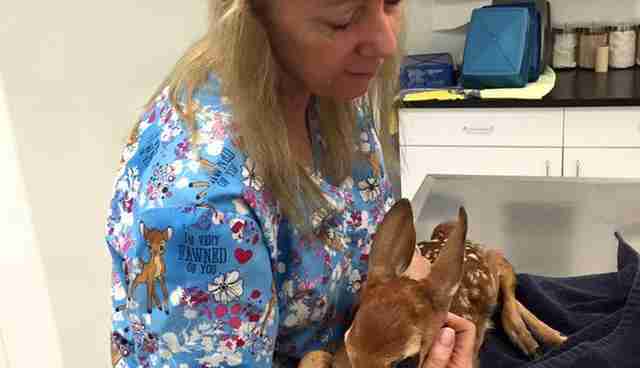 "The fawn was found to have deep puncture wounds that were already infected and full of maggots," McDaniel said. "The injuries were probably several days old and likely the result of a red fox or dog attack." He added that it appeared the fawn was orphaned and became vulnerable without her mother's care, only growing sicker without medical attention for her untreated injury - until she was rescued. As it turns out, she picked the perfect place for both shelter and to get help. "Hopefully, this young one will be rehabbed and later released when [she's] able to survive on [her] own," Susquehannock wrote on Facebook. So the moral of this story? It's still not OK to pick up a fawn just because he or she is found alone, but if you do suspect something is wrong or don't see a mother for hours, that's the time to call a wildlife rescue.